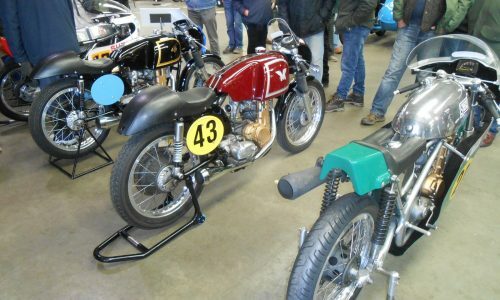 Visiting Australia for the first time, Costello has achieved a lifetime ambition to race down under at the Barry Sheene Festival of Speed alongside Phil Read MBE, visited the impressive HART Honda training centre and soaked up some Aussie coolness at the HQ of Australian custom bike builders, Deus Ex Machina. 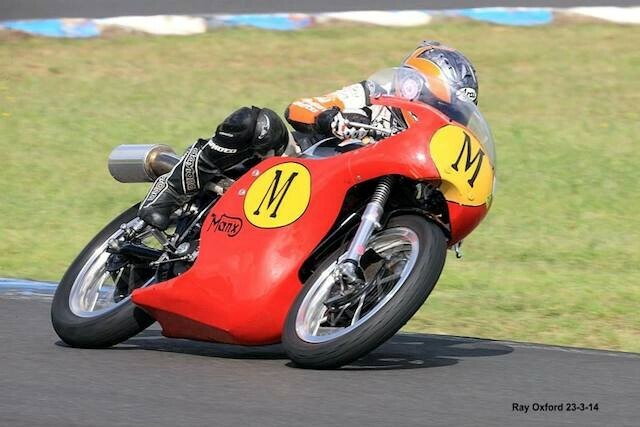 Maria made her debut at the circuit formely known as Eastern Creek, on three race machines; a Manx Norton, Honda VFR400 and Honda RS125 owned by Mick Neason, Rob Francis and Steve Kairl respectively. 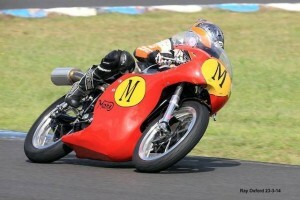 Costello had a good start at the circuit formerly known as Easten Creek and despite only a brief pratice session on each of the three bikes on Friday morning she went on to racing to finish 6th overall and 2nd in class on the Mick Neason Manx Norton that afternoon. She followed that up with a great 4th place finish in her first ever 125 race, onboard a 1988 Honda RS125 race bike provided by Steve Kairl. Despite having raced in many countries in recent years, Maria received a few key reminders that she was on Australian soil: “I’m loving everything about my Aussie debut. Having to dodge a turtle at turn two was a new one for me. Everyone at the event from the organisers to office staff to marshalls to competitors have been so welcoming. And I’m so glad I received support from SKINS in time for this event as they’re really helping me cope with the heat here. I also decided that Australia would be a great place to debut my my new Arai helmet paintjob designed and painted by Steve Snape”. Sunday was another mixed bag for Costello. The loaned rear shock from Leanne Nelson had helped Maria improve her times on the 125 but she finished in 5th place at the chequered flag. The 400 spat water out on the grid in race one and broke down after a blinding start saw Maria move from 38th on the grid to 15th place on lap one. She did however close the event on a high note with a 2nd in class finish on the Manx Norton. Maria reflected on the experience: “I’ve had an awesome time. There are so many people I need to thank, including Grant Paterson for helping make this happen, Peter & Janet for the inivte and making me feel so welcome, everyone at the track, especially the other female competitors, and wonderful ladies in the office who made the event such a cracker. Finally thanks to Mick Neason, Rob Francis [I don’t know who was more disappointed with the break down, me or Rob?] and Steve Kairl for respectively allowing me to race their Manx Norton, VFR400 & 125 race bikes. Maria’s biking experiences in Oz didn’t end there. 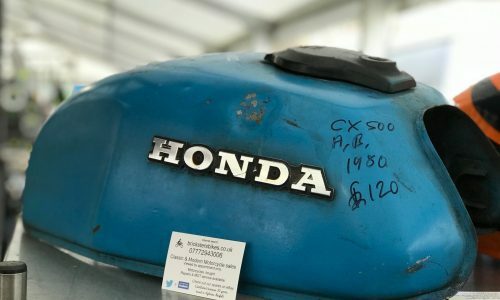 She was then was given a tour of the impressive Honda Australian Roadcraft Training centre by Manager, Rod Hill and soaked up some Aussie coolness, hanging out with Mikey and Jackie at the HQ of Australian custom bike builders Deus Ex Machina.